Traditionally, a Diwaniya is a relaxed place where people gather to discuss significant issues of the day. 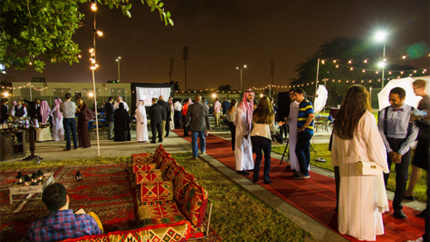 The Entrepreneurship Diwaniya is a series of networking and educational events connecting established Saudi and U.S. entrepreneurs with emerging youth innovators. The effort aims to connect and establish a community of advocates, professionals, investors, and creative thinkers that can advance the Saudi entrepreneurship ecosystem. Since the program’s inception in May 2016, Diwaniya events have brought together over 600 people focused on hands-on skills building, innovative team building, networking, research, and mentorship. Monthly Diwaniyas feature prominent entrepreneurs and innovators to discuss a range of topics – from “Building a Creative Team” to “Creating Silicon Valleys Around the World.” Speakers have included a Senior Advisor at the Saudi Ministry of Energy, a Chief Technology Officer from Baker Hughes, and leading entrepreneurs from Saudi Aramco. These activities culminated in the Entrepreneurship Diwaniya Summit in December 2016, held at the Dhahran Techno Valley research park. Over 120 alumni and 30 private sector companies and organizations participated in the three-day summit, exploring topics such as design thinking, entrepreneurial leadership, and small business development across 27 workshops, panel discussions, and keynote lectures. Among the keynote speakers was leading innovator Dave Blakely from the Stanford Design School and mach49 Incubator in Silicon Valley, who led hands-on sessions on innovation teambuilding and customer-focused research. For alumni participants, the Summit opened a new network of professional contacts and mentors to drive their ideas forward. Alumni expressed that this experience helped foster new connections and relationships, and ultimately expanded their networks, both in Saudi Arabia and abroad. The team behind this amazing series is the Dhahran Alumni Steering Committee: Retal Al- Turki, Abdulmalik Kohaji, Alaa Al-Abdrabbuh, Reem Al-Ghamdi, and Batoolah Al-Shabbar. They come from a variety of different programs including the International Visitor Leadership Program (IVLP), Middle East Partnerships Initiative (MEPI), and the Saudi Young Leaders Exchange Program (SYLEP). Their goal for the series was to create opportunities for alumni of diverse backgrounds and professions to share challenges, best practices, and foster cooperation. Peter Winter, Public Affairs Officer at the U.S. Consulate in Dhahran noted, “as Saudi Arabia embarks on its transformative Vision 2030, this group of alumni identified a key area for collaboration, building a network of young Saudi and American innovators, advocates, and officials to drive forward the country’s entrepreneurship community." The committee successfully brought together alumni from across the country, and hopes to continue expanding their membership and network throughout the country and regionally. They will hold elections for new committee members soon. We look forward to seeing how this initiative continues to grow.